Burdock root is a popular folk remedy, and the fresh root is also a tasty vegetable. It is a superior tonic herb and alterative herb. 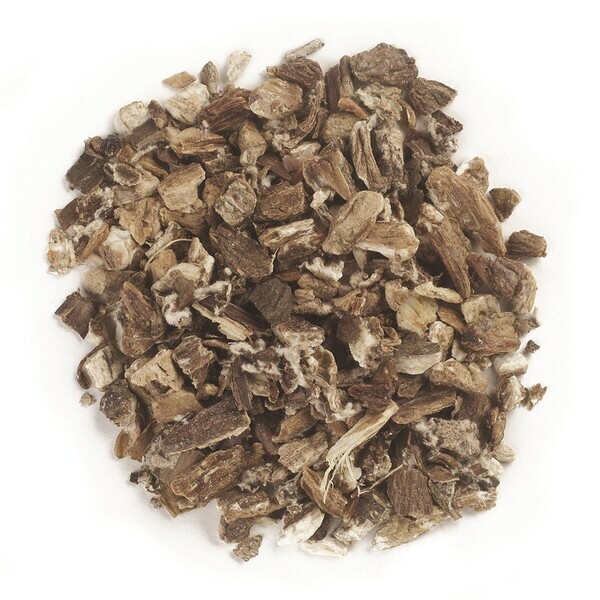 Burdock has a special affinity for the skin and is used in all types of skin preparations. It also makes a pleasant tasting tea. The Plant: Burdock is a wide-ranging plant, native or naturalized across North America, Europe and Asia. Usually a biennial, it consists of a rosette of leaves the first year, becoming tall and stately when it is in full bloom in the second year. It can grow up to ten feet tall and three feet wide. It's large, broad leaves, which resemble rhubarb leaves, are bright green with the undersides covered with white, wooly hairs. The flowers are purple and thistle-like in appearance. The burr-like fruits stick to clothing and animal fur and can be painful to remove. Burdock has a long, slender taproot that can grow up to three feet deep. It is commonly found in waste areas and is often considered an annoying weed because of its large size, clinging burs and persistent growth. The taproot is the part used as the herb. 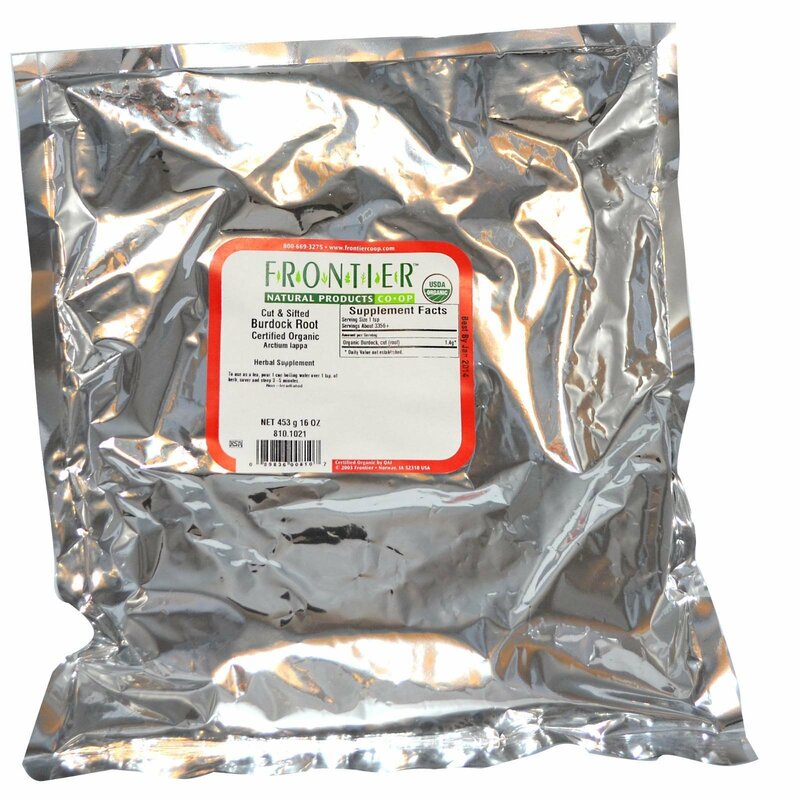 It should be harvested in the fall of the first year, since inulin levels will be highest then. In the spring, the root is more depleted of its energy — and once the roots start to grow, they are considered too weak to be useful. Constituents of Note: Inulin is the most abundant constituent of burdock, being present at up to 45% in the root. Other constituents include mucilage, a tiny bit of essential oil, tannins and a number of plant acids. Quality: Burdock roots have a brown bark and a light tan or ivory interior. If the fresh root is damaged or cut, the part exposed to air turns dark — so good color is an indication of proper handling and drying of the fresh roots. Burdock root powder is tan in color with a faint aroma and a slightly sweet and bitter, mucilaginous taste. Did you know? Burdock is grown as a vegetable, primarily in Japan, where it is called gobo. The young roots are harvested before they become fibrous, are peeled to reveal the creamy interior, and then eaten raw, like carrots, as well as in soups and stir-fries. Gobo has a crunchy, somewhat sweet and starchy flavor, and when eaten as a vegetable it is a source of dietary potassium and magnesium. Burdock, like its relatives salsify and chicory, does not contain starch, but rather inulin, a non-starch alternative for energy storage for these roots. To use as a tea, pour one cup of boiling water over one teaspoon of burdock root. Cover and let steep for 3 to 5 minutes. To make a decoction, add one teaspoon of burdock root to one cup of water, bring to a boil and simmer for 10 to 15 minutes. The flavor of the tea is considered pleasant and more palatable than other herbs with similar uses and therefore often the herb of choice for teens, children and picky adults. Burdock roots are considered purifying, cleansing, cooling and tonifying to the body. They have a special affinity for the skin and are used both internally and externally for improving skin health. Burdock is often combined with yellowdock root, cleavers or red clover to make a tea or skin wash.